and less cost…. Solid State Drives (SSD) have constantly been dropping in price since their introduction some years ago, which is great because this fantastic technology is reaching the stage it is massively affordable no matter what your requirements as a user. Don’t get me wrong as a GB per £1 solution it is still more but given most users won’t fill a 2TB Drive why get your hands on so much storage… At HardSoft we are happy to say less is officially more! 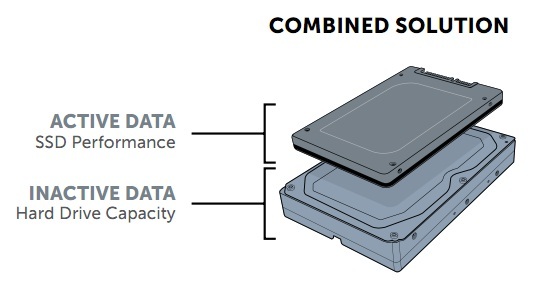 So what are the key benefits of introducing an SSD to your new PC or Mac ? For a start on a Flexible Lease you will barely notice the extra cost over conventional Hard Drive (I’ll go into pricing in more detail below). The go to argument for SSD has always been and will always be the fact the data moves directly between Drive and Machine – no moving parts / spinning disks that need to be read, so in real terms this means a significant reduction in Boot time, time to launch an application and file saving / duplication. In tests the SSD also adds around 10% to the battery life of a Laptop compared with a conventional Hard Drive. And for those of you who really want to go to town and get the very best of Storage and speed there is now 960GB SSD which you could add to your MacBook Pro for just £8.30 + VAT per week. This is manufactured by OWC and is originally 1TB but formats down to 960GB. For Windows 7 PC users then we are now offering the Crucial Adrenaline which is a 50GB SSD drive that works WITH your existing SATA drive to give 8X the performance. Just 0.65 pence ex VAT per week on a three year lease. This is the perfect and inexpensive upgrade for HP Graphics Workstations and highe end PC’s. This technology is often referred to as Solid State Cache and is the same principal as the Apple Fusion drive options available on the new iMac and Mac mini. Last thing to consider is that to get the most out of a Hard Disk Drive it is recommended you leave around 10-20% of it unused to get the best out of the drive and keep it running at its best so automatically makes that 1TB HDD a potential of only 800GB. One last bonus, no need to ever defragment your SSD – infact doing so would harm the life span of the product!